If the internet powers that be are smiling, I will soon own a DVD of the Ramsay Brothers' Purana Mandir, and you bet your bippy I'll be reviewing it as soon as I watch it. Regular readers are probably wondering why I'm watching such a thing, given my very low tolerance for scary and creepy movies, no matter how unrealistic the gore and frights are. All I can say is that The Horror!? is to be held responsible. On the up side, it has been suggested that I reciprocate this adventure into unfamiliar territory by making him watch Hum Aapke Hain Koun. Totally fair trade, I'd say; I found HAHK utterly irritating and unwatchable when Si and I tried to revisit it this summer. Actually, a few years ago I got into a similar cinematic downward spiral with a coworker: he couldn't believe I'd never seen Point Break (I avoid both Patrick Swayze and Keanu Reeves like the plague) and I couldn't believe he'd never seen Heathers, which was the sine qua non of my high school social circle. We got together every Wednesday after work, cooked dinner, and watched each other's movies. Each thought we had suffered unduly more than the other, so a series of revenge suggestions began. The nadir for him was Cold Comfort Farm, and for me it was Big Trouble in Little China. Somehow we're still good friends, but we haven't been to a movie together in years. Anyway. I'm sorry I haven't been posting very much in the last few months. There's a dangerous backlog of unreviewed films teetering on top of my television, and I hope in the upcoming weeks to provide you with much joy from October's binge of 60s Shashi - Waqt, Pyaar Ka Mausam, and Raja Saab - and, finally, the long-awaited, super-duper, masala-o-rama Suhaag. Preppy, minty-hued, grin-flashing Shashi approves this plan. He likes it so much that he's going to climb a hill with his guitar, stand on the edge, and do a three-quarter turn and fling out his arms with delight. Then again, aren't we all? 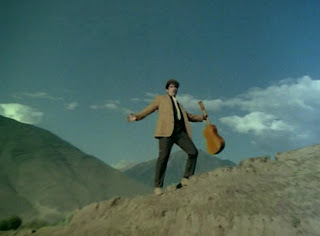 Now that I think about it, I'm going to make the hilltop balladeer three-quarter turn arm-fling the official hero pose of Beth Loves Bollywood. Everybody now! beth, I'm glad you checked out the backwass Purana Mandir as it clearly belongs in the Horror Halloween state of my Pradesh, it was delightfully gawdy, loud, and OTT which makes me love the Horror masala even moree! Oh, Shashi, how I've missed you. Oh, I do look forward to your review of 'Purana Mandir'. I've never, never watched a Ramsay film. I am starting to feel guilty about all the Shashi we watched. Hopefully you will manage not to get too scared with Purana Mandir. Heathers and Point Break? What a wonderful combination! Anyway, you'll probably love Purana Mandir. God, I am a bad liar. This post made me realise that I like Heathers, Point Break, Hum Apke Hain Koun and Big Trouble in Little China!!!! Seriously is there something wrong with me? Oooooh, Purana Mandir! Goody, goody gumdrops! Actually, I have been saving the sequel (Purana Mandir 2: Saamri) for a special occasion. The time may be nigh. It's really hard to type with my arms outflung in the official BLB pose. I might have to use my nose or something. Rum - Is Horror Halloween a permanent state in Masala Pradesh, or is it more of a seasonal gathering? Either way, I'm glad it's there, but I might have to ask that its borders not touch Funkadelic, where I preside. PPCC - I KNOW! Sigh. Banno - You haven't?!? Then why am I? gebruss - Ts! Shashi and guilt do not go together. If anything is to blame, it is Hulu, where I have been sucked in to watching old episodes of Bones, American Dad, and Roswell. house - NO. It was not wonderful. Though I should state for the record that Point Break was neither as bad as it could have been nor as bad as I was expecting. And now I must wonder what else have you been lying to me about? Anarchivist - There's a sequel? And what an intriguing warning! Ajnabi - Agreed, very hard. You will notice that the menfolk get to (have to?) do it a lot more than we do, conveniently leaving us able to pluck flowers, hold bunnies, put the backs of our hands to our heads and should "Nahiiiiin! ", wave our dupattas in the breeze, cook, and type. I have yet to decide what the official heroine pose is. Definitely something that Vimmi/Babli does, though. 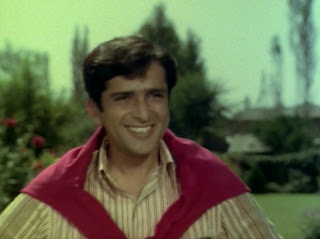 And 60s Shashi is the best antidote to anything (even if he is bit of a wet-blanket sometimes, like in Waqt)! I'm not sure we can still be friends -- Big Trouble in Little China is one of the greatest films ever made. I have to agree with the Keith - Big Trouble in Little China is AMAZINGLY AWESOME. I've been meaning to give HAN...K! a re-watch because I didn't know much about Bollywood when I first saw it and I'd like to see if my impressions have changed. Thirdly, horror! YAY! Also, thirdly, thanks for pointing to the noir blog. I love noir! Filmi Girl - That was exactly my reason for trying HAHK again too - it was in my first ten or so Hindi films, and I was confused by it, but I figure there was a lot I didn't understand. But I just couldn't get into it. I lasted about 45 minutes and was so annoyed and uninterested I had to shut it off. Beth I've been meaning to forward you this - but finally got down to it. Five minutes into this video - and keep watching for a few more seconds for your favorite to show up. House, I was the one who suggested that Beth make you watch Hum Aapke Hain Koun. I appreciate her efforts to shield my identity, but I thought you should know just how deep the evil goes. I am a bad, bad man. Todd, if it's on a level with Big Trouble in Little China it must be a brilliant film. Right? Right? ...Actually, to be honest, I was hoping that the fact that I wrote a novella-length review of Jaani Dushman: Ek Anokhi Kahani would absolve me from any future commitments involving horrible contemporary Bollywood films. I watched it twice! Todd - Why are you outing yourself? Fool! I am of the mind that there are far worse movies than Dhoom out there - Dhoom 2, for example - so you might be safer than you think. On the other hand, it might just not be worth the bother. Blame my vanity... and my honesty. But mostly my vanity. Heathers and Big Trouble in Little China are both great movies. I can live without Point Break, but it's not unwatchable. I've been meaning to watch Dhoom, but it's way, way down on the list of trashy stuff I intend to see. Hello Beth - The only Hindi horror-ish movie I have watched is Bhoot Bungla so I look forward to your review. Am I unjustly neglecting this genre or is it unconscious self preservation? If I had the endurance, I'd now write a Lovecraft pastiche about Todd. "The Recommender of the Unwatchable" or something in that style. That seems fitting, since it was one of his posts that got me to watch Papi Gudia. I don't think I've recovered yet. Sometimes late at night I can feel that movie watching me from my DVD collection. I'm sure it just wants to play. Or maybe sing a little song. Well, it's the thought that counts, House, and I'm honored. But please keep in mind that, in order to recommend these movies, I have to watch them, too. And, Lurple, I'm sorry about Papi Gudia, but I had no choice. It's kind of like The Ring, except for, instead of a ghost with long black hair coming out of the TV to kill you, it's Karisma Kapoor in a mirrored catsuit. It's ok, I'm betting my own review has gotten at least one person to watch it, if only to find out if it's really that bad. So I too have probably passed it on. Bad movies are great that way. I recently challenged another review site to watch SuperBabies: Baby Geniuses 2, but I think they may be reconsidering. Todd, I am going to out me as a complete nerd now: After your SAN has reached 0, those things aren't a problem anymore. You can read the details in my So You've Made A Crappy Movie article, in the comments. They get to pick a movie for me to watch after they review it, so it's pretty similar to Beth's post, actually. I'll pretend I didn't understand your Call of Cthulhu reference, haha. Nerd! Ooh, Purana Mandir! I'm ashamed to say that I loved that movie, even though by any sane measure it stinks. I can't remember whether it's Purana Mandir or Bandh Darwaza (I got them on the same disc) where the costume designer obviously got a great deal on bolts of this very early-'90s sparkly, tufty, kind of chenillish fabric. The heroines of the movie in question have at least two different complete ensembles made of this stuff, in both white and fire-engine red. I'm positive that it IS Purana Mandir which has the most bizarre and unamusing comedy relief sequence ever! Ahh, the world of 1980s Bollywood horror! Never have so many women taken so many showers while wearing so many clothes. Beth, if you're watching this one, I feel like I should get in the spirit of things and watch a turgid romance or something. Or maybe I'll just send you a copy of Wohi Bhayannak Raat. The scene where the zombies invade the discotheque is priceless. And if anyone can tell me what the hell is going on in the movie Cheekh, I would appreciate it. Movies as relationship test...interesting! I don't have such a thing either. That'd be a great poll question. I'm really tempted to say I'd automatically reject anyone who doesn't like Pillow Talk at least a little bit, but one of my best friends hates it, so I guess that's not fair. Todd - Thanks. The idea of Karisma in the catsuit is haunting me now and I haven't even watched the movie (other than the excellent "Do YOU love music?" song, which Army of Monkeys forced on me some time ago). Thalia - Did you?!? Do tell! I am really looking forward to the costuming now, I must admit. Maybe it'll make the Fugly list! Keith - Yes you should. I'm going to send The Horror?! the stupidest, "I think I just threw up in my mouth a little"-est movie I can think of. But I am interested in these discotheque zombies of which you speak. Not just a disco zombie, but a disco zombie in a white flared leisure suit with a red scarf. Unfortunately, the VCD of Wohi Bhayannak Raat is severely flawed to the point of being almost unplayable. I don't know if that's the case with all of them, or just my copy (it's all about really awful errors in the encoding process, so I'm guessing it's widespread -- or as widespread as ownership of this VCD is, which is probably about 12 people).